Pretzel Logic's Market Charts and Analysis: SPX Update: Is the Rally on Its Last Leg? Or Its First? 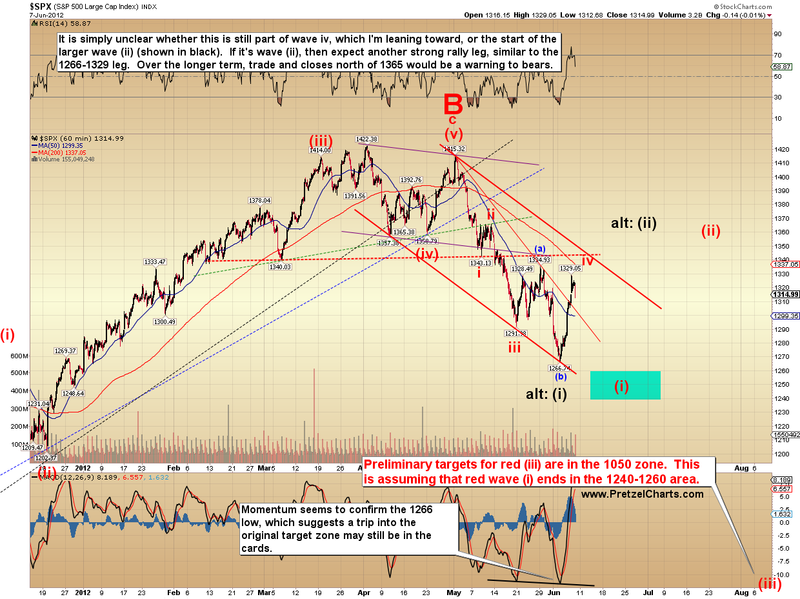 SPX Update: Is the Rally on Its Last Leg? Or Its First? On Tuesday I warned that bears should be cautious, and that a large rally could unfold if the bulls were able to breach 1298. That's indeed what happened. Now the challenge is in trying to fit the puzzle pieces together to determine what's coming next over the short term. The big picture still seems to indicate that the rally is corrective to the larger trend, which is now down. I would give greater consideration to longer-term bullish potentials if the S&P 500 (SPX) can sustain trade and closes north of 1365. Unless and until that occurs, I will maintain a bearish long-term stance. The short term is (of course) open to interpretation, but perhaps moreso than usual. The interpretation I'm leaning toward is that this rally is actually a continuation of the correction which began back on May 21. This would indicate that the rally has nearly run its course already. My best-guess would be another thrust up to a slighly higher high, and then a reversal downward. But it's not a clear short-term picture. The alternate potential is that the rally so far is only wave a-up of an a-b-c. 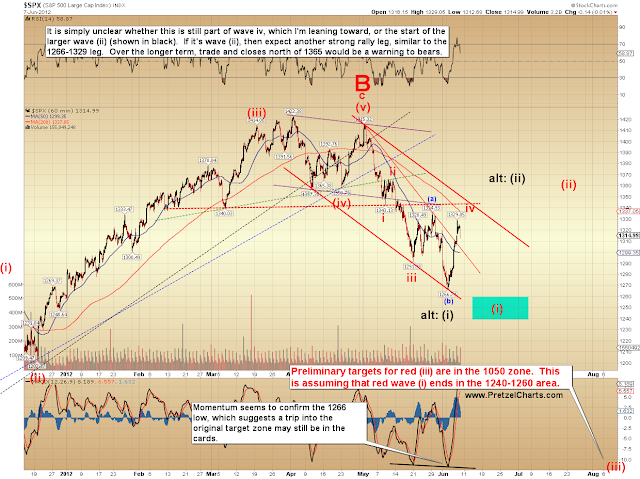 Wave b would follow soon, and be the correction lower in that case. That downward correction would then be followed by wave c-up which would unfold in similar size to wave a. I don't like that interpretation as much, because the structure of the decline from 1334 to 1266, and the character of the rally (which has behaved more like a c-wave), both lead me to believe this is a continuation of the earlier correction -- so I would give the a-b-c option roughly 40% odds against the first pattern I discussed. The chart below explores the intermediate picture for the SPX, and as mentioned, the preferred count believes the market either has completed, or is on the verge of completing, red wave iv. The alternate count considers the option of a larger rally. The second chart examines the short term, and notes the potential inverse head and shoulders bottom, which is a pattern that should give bears pause (paws?) if the market can sustain trade above the blue dashed neckline -- though the preferred count considers that it's entirely possible that the market will break this line, at least briefly. In conclusion, my best guess over the very short term would be for another small thrust higher (though this isn't required), followed by a reversal toward the mid-1200's. Over the intermediate term, I believe this rally is corrective regardless of which short-term interpretion is correct, and the market will go on to make lower lows either way. 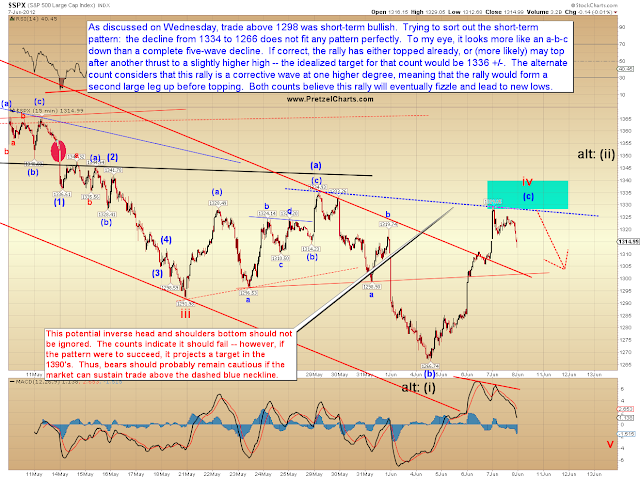 Ultimately, the best interpretation of the wave structure suggests the October 2011 lows will, in time, be revisited. 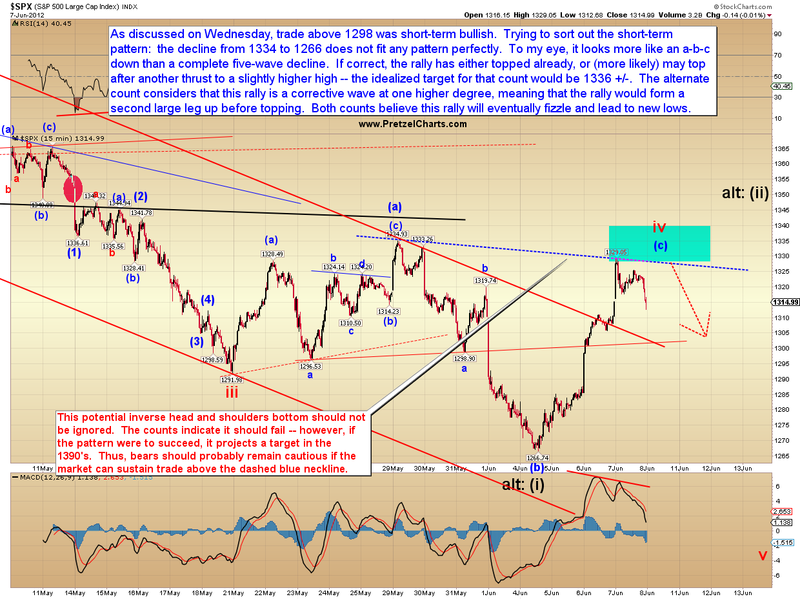 Sustained trade and closes north of 1365 would cause me to reexamine this bearish outlook. Trade safe.